Review: Pirate Captain sets out on a mission. His mission is to try and win the Pirate Of The Year Award. This takes him and his rivals from the shores of Exotic Blood Island to Victorian London. 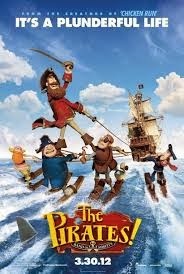 Really funny animation film! Why this didn’t win any awards at the Baftas or Oscars for best Comedy I really don’t know. Much better than I was expecting it to be. Very well animated. The colours that they have used for this film are very bright and stand out.